Thanks to El Guapo for the fun new title! If you are just joining us, you can read Part 1 here. 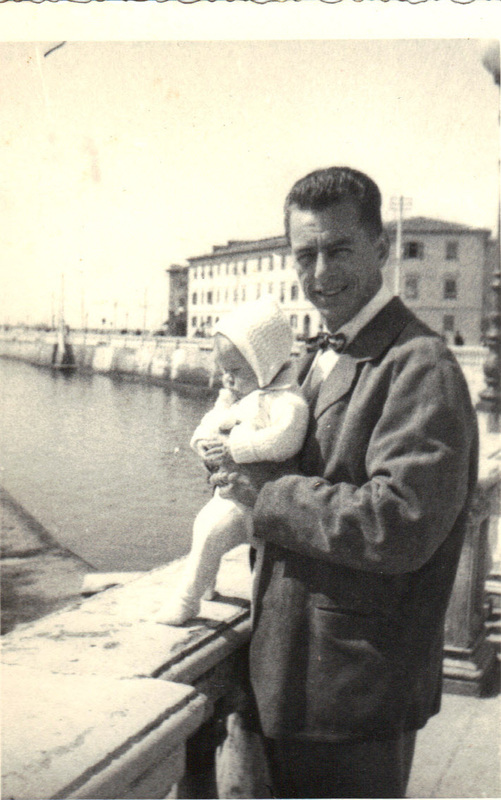 We are in the late 1950s, and my Dad has taken a job as a spy with a global communications company, working on an Army base, and my parents have spent five years living on the Mediterranean in Livorno, Italy, enjoying life as a young married couple. And then, along comes their first daughter, the author; Roby to her friends and family. 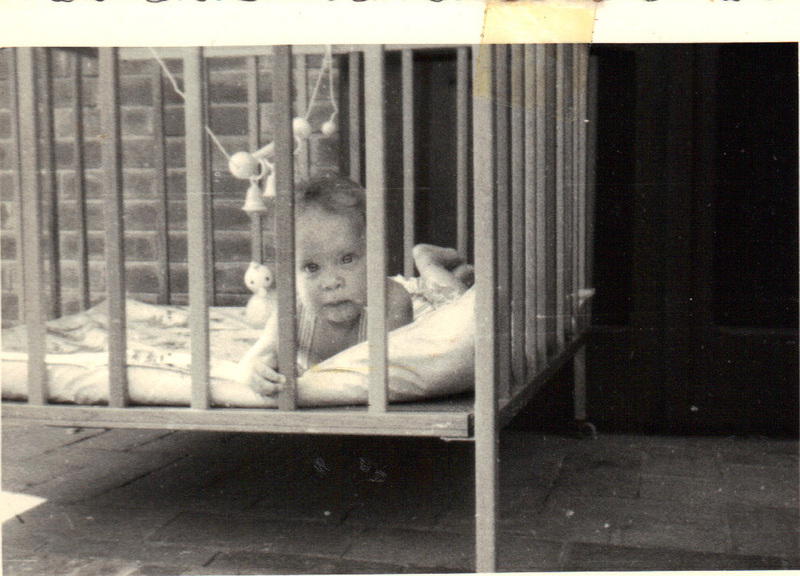 And the fun was just beginning…Dad wrote on the back of this next pic “July 1960 – Roby wanting OUT!” And so it would, and continues to, be. Dad’s spy job takes our young family from Italy to Frankfurt, Germany, where a second daughter is born; 10 days later I turn 5 years old. Another move to Weisbaden, for a couple of years, precedes a major move to the United States. I started second grade in Florida, after several years of preschool and kindergarten at international school with kids from all over the world. It was a bit of a shock, as I recall. None of my new classmates spoke other languages. Their Moms weren’t foreign; their Dads worked at the Kennedy Space Center and came home at 5:30 each night. My Dad worked in Saigon, Lagos, Brussels, and other exotic spy locations. Over the years, he came home for extended periods, and there were times that he did work semi-regularly at the Space Center as well. When Dad was home, he had only one volume: LOUD. My friends were afraid of him, but we assured them he wasn’t mean or scary. That was just how it was in our house. Loud. Even as a kid, I understood that Dad liked to drink and was a happy hour kind of guy. My parents had parties for their friends and I helped bar-tend, even as a youngster. Today that would probably result in a call to Child Protective Services. I remember the smell of nail polish, cigarette smoke, and cocktails, and I very much liked being around the grown-ups while they were socializing. The downside of Dad being a happy hour kind of guy was waking up in the middle of the night to find Mom worried that Dad was not home yet or worse, that he was and his car was in the garage with obvious signs of collision. I don’t recall him being injured, but I do recall being very scared at the time. As soon as my younger sister started school, Mom got her real estate license, and went back to work. This too, was very unusual among my friends, whose mothers played bridge and had dinner on the table every night at 5:30. 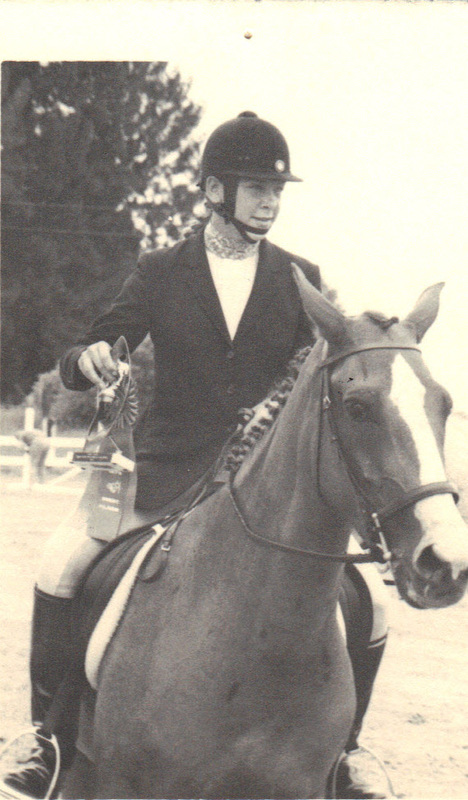 When I was nine, I started English riding lessons, and my sister followed after a couple of years. 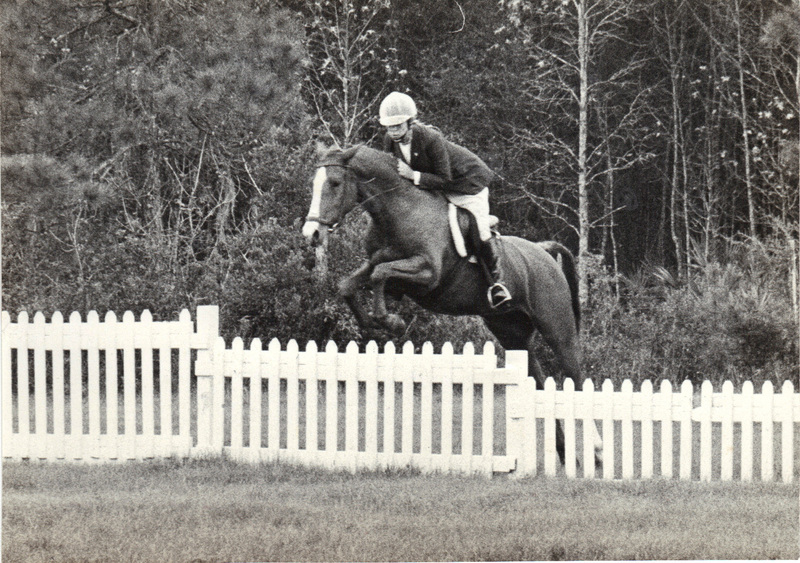 The lessons soon morphed into a total horse lifestyle, and serious competition show riding, with three horses, all the equine and horse show equipment, as well as, the requisite horse trailer and truck to tow it. Today, I can only imagine the wads of cash Mom and Dad must have thrown at our sport. In hindsight, it was in my early teens when Dad really started influencing me towards independence and a total lack of regard for gender stereotypes. I started mowing the lawn regularly around 10 or 11 years old, while only boys did that in other families. I was expected to help earn the keep for our horses, and I mucked stalls for our three, as well as, for other owners in the barn. I had a savings account and was expected to contribute regularly. Dad bought an old Ford pickup to tow the horse trailer, and I was not only expected to learn to drive the 4-speed-on-the-column, I was also expected to learn to pull the trailer! I was 14; I could drive the old truck, as well as, Dad’s stick shift Simca, so the reasonable solution as to how my sister and I were going to get to the barn every day was that I was going to drive. After all, Dad was working in Africa by then, and Mom was now a real estate Broker working 50 hours a week, so it just made sense. Never mind that the driving age was 16. That rule was for other people. 1974 was a dark year in our family history. Our family doctor was the father of one of my good friends, and during a routine visit, he found a mole on Dad’s shoulder that in his words “just didn’t look right”. To our horror, it turned out to be a melanoma, which at the time was nearly unheard of. Dad underwent surgery to remove the mole, and they ended up taking his lymph nodes as well, because they too showed signs of cancer. The surgery was followed by chemo and radiation, and the prognosis was that he would be checked regularly, and if there was no recurrence in 5 years, he would be good to go. The summer of my 15th year, Dad arranged a month-long vacation for the family, spying in touring multiple European cities, and culminating in a week in Lagos, Nigeria, where he was based at the time. Typical obnoxious teenager that I was; I had to be dragged kicking and screaming. Well, only at the outset. Landing in London, I realized that this really was the opportunity of a lifetime. London led to Brussels, then Madrid, and Rome, with a trip back to our old home in Livorno, where Dad, Mom and I took the same photo we had taken when I was three. 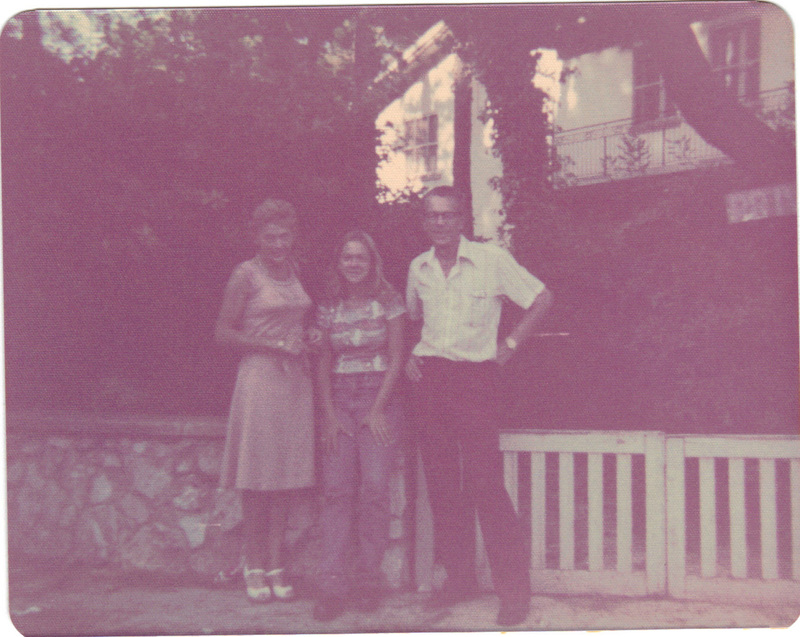 I wish I could find that original photo, where I was standing on the wall between my parents…but this version will have to do. This trip was an eye-opener for this American teenager. I had traveled extensively as a small child, but I only have bits and flashes of memory of those trips. Now I was able to enjoy and fully experience the different cultures, food, and sights. We met old friends and spy colleagues of my Dad in all our stops. We were treated royally, eating in the best restaurants, staying in fine hotels, and my sister and I enjoyed having our own room and watching racy European TV. On July 29. 1975, Colonel Joseph Garba and a number of other middle-ranking army officers, led by Brig. Murtala Ramat Muhammad, overthrew the Nigerian military government of Gen. Yakubu Gowan in a bloodless coup and set themselves a four-year timetable for restoring democracy. It took hours by taxi to get from the airport to the hotel, due to the chaos in the streets. And that was only the beginning of the things we saw during our stay. Nigeria in 1975 was a land of contrasts: extreme wealth and crushing poverty; fancy hotels and restaurants backed up by endless shanty towns with open sewers running down the street; impeccably garbed men and veiled women; and scary looking witch doctors threatening to curse you if you didn’t pay them. Children and adults who were purposefully maimed so they could have a chance at a beggars living were everywhere. All I can say is that my eyes were opened on this trip, it changed my view of my privileged life forever. Nigeria was a very patriarchal culture, and while there, my Dad’s desire to challenge the status quo became clear. He took his wife and two blond-haired daughters everywhere. In most public places, you saw only men, especially in the fine restaurants. We became a spectacle everywhere we went. In addition, he not only let me, but encouraged me, to drive while we were in Lagos, never mind the fact that I had only a US learner permit. It was comical to see the faces of people on the street, as we went by in a rented car, driven by a young blond woman. Women were barely seen on the street, much less did they drive. I remember loving the whole idea of likely breaking laws, as well as, social norms. And of course, this was only the beginning. It’s fascinating reading about someone who learned it from the very beginning. Kudos to your parents and how they raised you! Guap, it is a fantastic title, thank you very much! 🙂 And thanks for reading and the kind words, as well. I do remember thinking anything was possible, but I was a bit of an old soul, even as a kid, and probably could have used a little more kid time, if truth be told. The funny thing is that your question made me wonder if I remember everything the way it really happened. And I realized that I have no idea how my sister perceived our growing up years. I know for much of that time I was the mean older sister, and that I do regret. It wasn’t until we were well into adulthood that we were anything resembling close. But I will find out how she perceived things, and see how it compares. One of my sisters describes our childhood as “growing up in three different homes” from the differences in how we remember our younger years. And as your muse, I guess it behooves me to not throw bad ideas out there. Like mentioning that one time with the cheez whiz, the whipped cream, and that poor, poor boa constrictor. Oh, no no, as my muse, you absolutely MUST throw bad ideas out there! However, I can tell you now that there will be no boa constrictors in my stories, haha! Amazing and incredible adventures so young and a blessing for you to have. Can’t wait to read the rest of the story. Aaah yes, Roby, the foundations for the reluctant, successful, corporate business woman heading off down the highway on her anything-but-business-like motorbike origins become clearer and clearer. What a fabulously eclectic upbringing, I’d love to have you sitting in my bar gradually out-amazing my crazy-arse mates with your stories. Looking forward to part 3. 😀 RD, I believe this may be my favorite comment so far! You pretty much nailed it in your description of me. I would love nothing more than regaling a bunch of crazy mates in a bar…it has happened before, as you will see in future editions. Working on part 3, but darn work keeps getting in the way! I was also born in July 1960 and moved all of my life and later on taught in International schools. Love that your dad encouraged you to defy stereotypes. And amazed he took his family to Nigeria . Keep it coming. Ha, Shelley, we may be twins from different mothers, except yours is WAY funnier. I definitely am my Father’s daughter…and I believe a life lived all over the place is a tremendous way to get an education, above and beyond the formal one. OH MY GOSH!!! My mind is blown, you might be the coolest person I know. Your life… what the heck, it’s like a movie. Wow, Aussa, hehe, that is funny (but also very nice), coming from you! Your life should definitely be made into a movie! It’s just cool to have a forum for sharing these stories, right? Definitely! We can all continue to surprise each other, it would seem! No wonder you’re still breaking stereotypes….I love how our past defines our future so much, right? Adoring this story, Roby! 😀 Thanks, Beth…it hasn’t been boring, that’s for sure. P.S. The photos are amazing. P.P.S. That Neil Young song is a fave of the hubs, too. Yes, that song: makes me cry sometimes, but also makes me happy.